Specifies the device name. For some device, this column may display meaningless name, like "USB Device". If the device name is meaningless, try to look at the Description column. The description of the device. Device Type: The device type, according to USB class code. For more information about USB classes: USB Class Codes. Specifies whether the device is currently connected to your computer. If the device is connected, you can use the 'Disconnect Selected Devices' option (F9) to disconnect the device. Specifies whether it's safe to unplug the device from the USB plug without disconnecting it first. 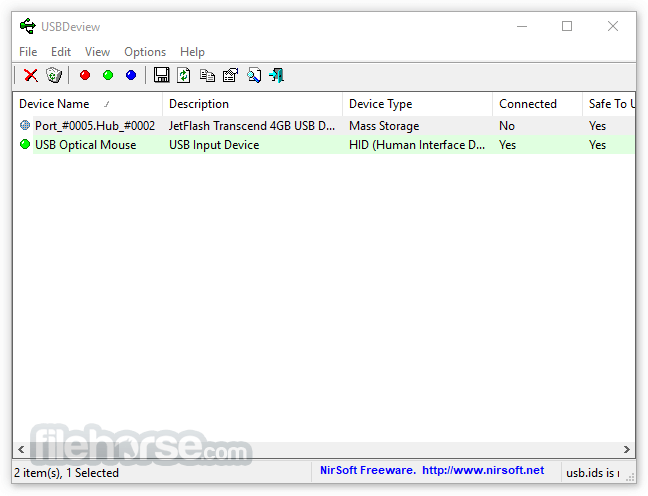 If the value of this column is false, and you want to unplug this device, you must first disconnect this device by using the 'Disconnect Selected Devices' option (F9) of USBDeview utility, or by using the 'Unplug or Eject Hardware' utility of Windows operating system. 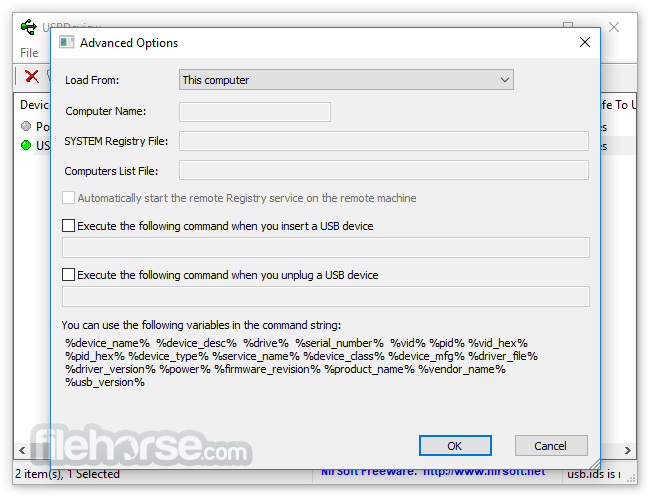 Specifies the drive letter of the USB device. This column is only relevant to USB flash memory devices and to USB CD/DVD drives. 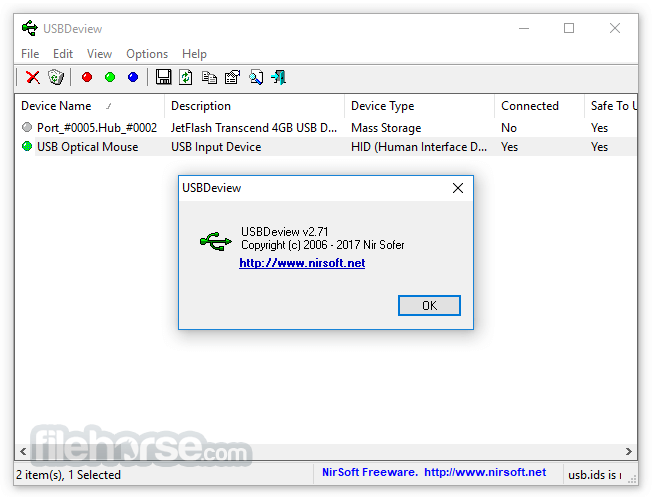 Be aware that USBDeview cannot detect drive letters of USB hard-disks. Specifies the serial number of the device. This column is only relevant to mass storage devices (flash memory devices, CD/DVD drives, and USB hard-disks). Specifies the date/time that the device was installed. In most cases, this date/time value represents the time that you first plugged the device to the USB port. However, be aware that in some circumstances this value may be wrong. Specifies the last time that you plugged/unplugged the device. This date value is lost when you restart the computer. Specifies the VendorID and ProductID of the device. For unofficial list of VendorID/ProductID, click here. Specifies the Class/Subclass/Protocol of the device according to USB specifications. For more information about USB classes: USB Class Codes. Specifies the hub number and port number that the device was plugged into. This value is empty for mass storage devices.